What is MYBA e-contract ? MYBA contract is a charter contract drafted by Worldwide yachting association, formally know as Mediterranean Yacht Brokers Association and it is the most commonly used contracts in the industry, particularly for large vessels cruising within the Mediterranean. MYBA terms is best understood as a “plus all expenses” contract. The contract allows an “À la carte” approach to all services. Basic charter fee includes: the yacht and all its equipment from spa to water toys to entertainment systems, the crews wages and their food, the ship’s laundry, operating consumables, insurance coverage for the yacht and crew Other expenses that will be charged to the charter at the cost paid with no markups: food and beverages for the charter guests, fuel for the yacht and tenders, harbour fees, communications, guest laundry, dockage, shore-side electricity MYBA terms have proven to be fair to both the charterer and the yacht so most charter yachts operate on MYBA terms worldwide. 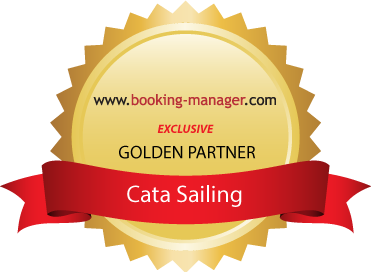 Cata sailing is an authorised user of the MYBA E-Contract. What is included in the price of a charter and what do I have to pay extra? The price includes: use of vessels and equipment according to the valid Price list, bed linen, and auxiliary boat with outboard engine in accordance to specification, gas, autopilot, GPS, usual services provided in the Charter base at the time of check- in and check-out, mooring fees in the domicile port and wireless internet. The price doesn’t include: fuel costs, marina and mooring expenses in other ports, port taxes and other taxes and fees. The security deposit varies according to the size and value of the vessel and has purpose of covering any damages which may occur during your stay. This means that any damage you cause, you are responsible for, only to the amount of security deposit. Upon the safe return of the yacht the deposit is returned in full to you. This is a tax that is mandatory to all visitors to the country since 2007 and paid to the tourist board to maintain a high standard of service. The cost of sojourn tax is 1.4 € / person/day for adults, children 12-18 years are charged 0,7 €/person/day while children 0-12 years do not pay the tourist tax. Tourist tax is to be paid on arrival upon confirmation of the crew list in cash. Advance Provisioning Allowance is the standard arrangement for paying your expenses such as fuel, food, berths and other when chartering a boat with a crew. There are no mark ups on the APA. The Skipper will make all payments out of this amount, and is obligated to keep all receipts and balance the account for you. You can review the expenses at any time and any amounts not used will be refunded at the end of the charter. How and when should I pay for the reservation? Upon confirming the reservation the payment is to be done by a bank transfer in 2 settlements; 50% of the total price within 7 days upon confirming the reservation and 50% of the total price no lather than 4 weeks prior to the beginning of your holiday. Is it possible to charter a boat from any other day than Saturday and for shorter stay then 7 days? It's standard in charter that boats are rented on Saturday-Saturday basics. Short stay or renting the boat on some other day of the week is possible in low season. In high season dough, short stay is also possible but you would be required to pay full price of weekly charter. Can we book One way from Trogir to Dubrovnik? One way charter can be arranged on request with a supplement for one way service. Price of the one way service contains costs of the operational fee of check in / check out, diver service of the crew who will return the boat to the main marina and fuel for boat transfer. Due to the fact that the boat needs to be returned to it's original home port on time for new charter week the disembarkation in Dubrovnik needs to be done on Friday by 12 noon. What licenses do I need to navigate a yacht? Why do we have to leave a security deposit if the skipper is arranged by your company? Security deposit is never the less required as everyone on board is responsible for the boat. For example, you may cause some damage that is not the responsibility of the skipper. If skipper damages the boat in navigation, he is responsible for it, and he will cover the damage from his obligatory skipper’s insurance policy. What travel documents are requested to travel to Croatia? If you are coming from a state member of the EU then you can travel simply with your ID card, otherwise passport is required. Depending on your nationality, please check and apply for a visa. Additionally, we would recommend taking travel insurance for your trip. Are vessels and vessels crew insured? All our vessels are covered with Casco deductible franchises up to the deposit amount according to the Price List for the current year. The insurance policy covers Compulsory Passenger Insurance and Compulsory Third Party Insurance. Your personal belongings are not covered with insurance and any damage incurred due to gross negligence, or with the plain intention shall not be the subject to insurance compensation. What kind of safety equipment is provided? All vessels have life belts and first aid kit as well as the fire extinguisher and life raft as proscribed by Croatian low. Can we take small children on board and what can we do for their safety? Yes, but some precautions have to be undertaken. As an extra insurance for the youngest sailors we can provide safety net and lifebelts for the children. Please note that these services need to be prearranged and are extra charged. Usually we don't permit guests to bring pets on board. Animals are typically not accustomed to the conditions on a boat and sailing itinerary can be quite uncomfortable for pets. Occasional exceptions to this rule can be made so please ask. Is there a safe parking place in marina where I can leave my car? There is a parking in marina with enough parking space so even in high season you needn't worry about finding a place for your car. At what time can we embark and disembark? Embarkation starts on Saturday afternoon at 17.00 h but it can be arranged sooner if the boat is prepared earlier. The disembarkation needs to be done at Saturday morning the latest till 9:00 h.
Will someone show me the details of how the boat's systems work? Once you have settled on board a staff member will take you through the boat explaining how to use all of the vessels systems and machinery. Please feel free, at this point, to ask any questions about the function of the vessel - the more you know, the easier your vacation will be. What should I bring with me on board? Every vessel is fully equipped for charter. Apart from provisioning, you only need to bring your personal belongings. We recommend you bring, besides bathing suits and summer clothes, an extra sweater and long cotton pants for cool nights and a light waterproof jacket for the occasional rainy days. Soft luggage instead of bulky space-consuming suitcases is recommended since on board storage may be limited. Will I need to take any bed linen or towels? We provide bed linen and towels. If additional towels are needed then please let us know in advance and we can organize more to be put on board before your arrival. Please note that beach towels are only included in our comfort packs for catamaran bookings. Can we have the vessel provisioned before we arrive? The Adriatic Sea is suitable for sailing in all seasons but we recommend any period from late March to early November. Your choice of date certainly depends of your preferences and sailing skills. If your wish is to experience the lively atmosphere of costal towns, attend cultural events or visit nightclubs, summer is definitely best choice. The spring and fall seasons are ideal if you wish to avoid the crowds. What are the wind and sea conditions in Croatia? During the summer season weather conditions in the Adriatic are favorable for sailing. This applies for period between June and September, when the weather is mostly sunny and sea temperature is suitable for swimming. Given the fact that charter season actually starts in April and ends in November, the temperatures may vary significantly. The weather is still nice enough for cruising, but swimming is more exception than rule. Here are three main winds: maestral, bura and jugo. Maestral, typical summer wind that blows from north west, is a sign of stable weather. It's ideal for sailing, as its power is moderate and constant. It starts usually around noon with ending in the late afternoon. Bura is cold and pretty strong northeastern wind that rarely appears during summer. When blowing in the summer it is less powerful, although its force should not be underestimated. Jugo is strong southeastern wind which could be dangerous in the open sea. However most threatening weather during the summer period are storms that come quickly and usually last very short, but may cause pretty strong wind, rain showers and thunders. Generally speaking thunderstorms are more likely to occur in the north Adriatic region than in central or south Adriatic parts. When chartering can I leave Croatian territorial waters? No, without a prior notice this is not allowed. Should you wish to sail out of the boundaries of the territorial waters of the Republic of Croatia, you are required to inform us as soon as possible in order to additionally ensure and prepare necessary documentation for the vessel. What is the cost of marinas and harbors? Can I book a place in a marina in advance? Can I pay in Euros in Croatia? Although Croatia is a member of EU since July 2013, national currency in Croatia is still Kuna (HRK). EUR might be accepted in some establishments, but keep in mind that Kuna is most often the only means of payment accepted.